As a company, we are always researching the best available products on the market to recommend for our clientele. Just as we have high standards for the performance of our Polyflex Horseshoes - we expect the same high level quality from the products we use. We decided to see if we couldn't create our own product line using ingredients we trusted that offered results we could rely on. As it turns out we could - and we did! Today we are excited to offer five hoof care products to farriers & owners alike. Made exclusively here at our shop in Wellington, FL, product quality & effectiveness are our top concerns. Our latest addition to The Sole Solution product line is a smoothing hoof conditioner & protectant. Named Hoof Glass for the sleek coronary band growth it produces, this product stimulates healthy development, shields against the harmful effects of water and strengthens the hoof wall. Made with a proprietary blend of ingredients, Hoof Glass is most effective when used daily on clean, dry feet. An old school remedy that you may already be familiar with, Sugardine is used as a treatment salve for hoof abscesses, wounds and more. This product does an incredible job of nourishing healthy tissue growth. We recommend adding this product to your first aid kit to use to treat & prevent infection, reduce swelling and deodorize necrotic tissue. Created originally to help horses combat the Florida environment - the Copper Cleanse is a simple product meant to be used daily on horses exposed to high levels of bacteria & moisture. Horses who benefit most are often those kept stalled and exposed to ammonia, worked on moist footing or kept in a humid climate where bacteria thrive. We've discovered the key to keeping a horse's foot healthy in inhospitable environments is to maintain an environment within the foot that is resilient to bacteria and fungi. 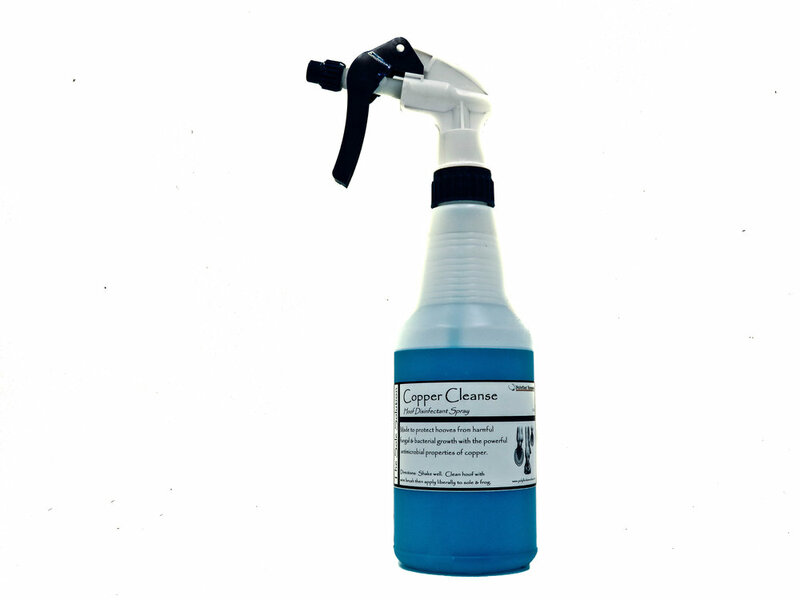 When sprayed onto the frog & sole of a horse's foot, the Copper Cleanse serves as both a disinfectant flush and as a PH neutralizer. Used daily, the Copper Cleanse serves both as a great preventative product & as a treatment product. This non-caustic cleanse flushes harmful bacteria & debris from a quarter crack without compromising sensitive tissues. We have had great success with healing a variety of quarter cracks by incorporating a drain into our patches - however the drain can only function if properly maintained. This rinse is designed to work in two ways. First to flush the drain, and second to medicate the crack. The ingredients we use not only accomplish both but do so in a safe manner for you and the horse. The first addition to The Sole Solution line this product is already a popular addition to many hoof care regimens. For thin soled horses with increased sensitivity, or for horses exposed to habitual bathing or wet climates, it's common to suffer from soft, tender feet. 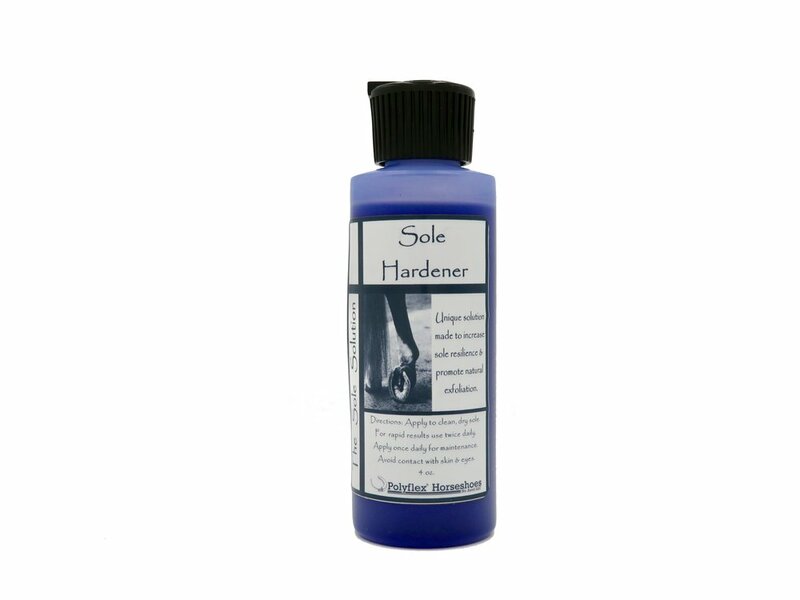 Applied once daily by painting the sole of the horse with Sole Hardener you will see increased sole resilience, healthy exfoliation & decreased sensitivity.